Effective August 17, 2017 at 8 a.m. visitors will be allowed to park in the visitor parking lot fronting Kamehameha Highway. •	There are new designated entrance and exit points that must be used. Entry is now directly after the bus stop going east bound on Kamehameha Highway. The exit point is further east. The visitor lot is now only one way. •	There is no left turn into the visitor lot entrance coming westward on Kamehameha Highway. •	The concrete area at the base of Tower 1 is reserved for facility State vehicles only and violators will be subject to tow at owner’s expense. •	All visitors must park within the marked visitor stalls provided. 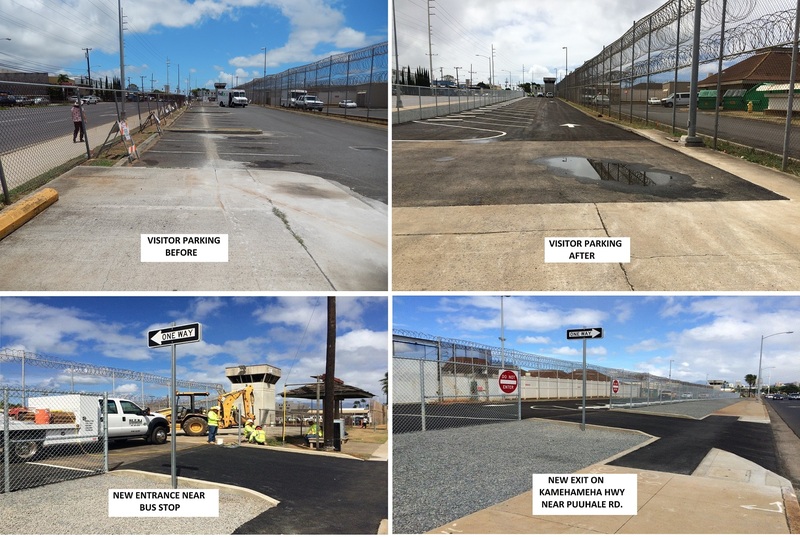 The project to resurface/repave the OCCC parking lot began in mid-July and was completed, as scheduled, in August.